I finally finished what I’ve been working on for the past month or so: Tempesthole version 2. Mostly I just needed a site that’s easier to update and manage so that I might actually update it more than once a year. Expect updates at least twice a year from now on – every other year. As always, the new stuff shows up on the blog first, so you might want to subscribe to the feed if you haven’t already. Anyway, have a look around the new site. I like think It’s matured like any fine lady should, becoming slightly more charming and considerably heavier than before. If you find anything that isn’t broken (images, links, etc.) please let me know and I’ll do my best to break them too. Please update your bookmarks as well. What actually is under the hood is WordPress with a custom theme specifically developed this purpose. I have just finished migrating my blog from Blogger to WordPress. Feedburner should have gotten the new source for it’s feed, which is why you are seeing all the old posts as new (in a pretty random order. Maybe I can even get this post appear as the newest one on the feed, so that you might actually notice it. If you have bookmarked the old blog – the hypnotic gaze compels you: Update the bookmark! Oh, and let me know if there are any broken links. You may have to clear your cache to get the header links working right. Update! Alright, this is basically just a test post. If you are reading this post on your feed reader, do not adjust your set – everything is working smoothly and you’ve already been redirected. Please, let me know if it’s not working right or it fucks up the feeds or something. …Oh, the image below is the bigger, clearer version of the small, vertical illustration mentioned earlier. I got my hands on Max Brooks’ Zombie Survival Guide the other day and I have to say it’s quite an entertaining book. And really useful too – in case it just so happens that zombies run over the human population. Reading the book also reminded me that I had my own zombie survivor that had to be dealt with. 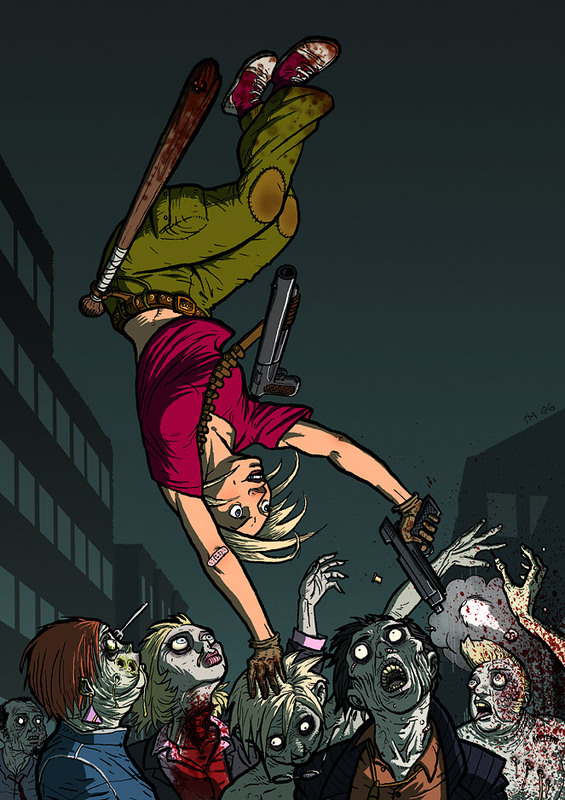 This lovely zombie-basher needed a background and I finally got myself around for doing one. So here it is.